Ōkunoshima and its imperiled bunny population remind us that wildlife and tourism don’t always mix. From its many “cat islands,” which boast more feline than human residents, to Jigokudani Monkey Park, where visitors can observe macaques bathing in the naturally occurring hot springs, Japan seems to overflow with fantastical wildlife enclaves. Perhaps the most adorable of all is Ōkunoshima, or “Rabbit Island”—but the cotton-tailed denizens for which this island is known belie its sinister past and ambiguous future. While Ōkunoshima, located in the Hiroshima Prefecture, is a popular tourist destination for those looking to get their kawaii fix, it was once hidden from maps due to its clandestine status as a World War II military location. Production of chemical weapons in the island’s poison gas factory began in 1929, and apart from factory workers and army higher-ups, few citizens were aware of its existence. Ōkunoshima was chosen for its location: discreet enough for goings-on there to remain under the radar, and far enough from densely populated cities like Tokyo to prevent mass casualties in case of an accident. The factory there eventually produced more than 6,000 tons of gas—primarily mustard gas and the irritant lewisite—before its closure at the end of the war. Chemicals wereould be shipped to Kitakyushu in the Fukuoka Prefecture to be weaponized, eventually resulting in more than 80,000 casualties (including and more than 6,000 deaths) among Chinese soldiers and civilians. Despite the fact that Japan was a signatory to the 1929 Geneva Convention banning the use of chemical weapons, none of the country’s citizens were prosecuted for employing poison gas. After Japan’s defeat in the war, most of the Ōkunoshima factory was destroyed, but laboratory buildings, the shell of a power plant, an army barracks, and a few other edifices remain. In 1988, local governmental entities and citizens opened the Poison Gas Museum to pay tribute to this dark and little-known facet of Japanese history. Displays include the ineffective protective gear worn by workers at the factory, which left them vulnerable to exposure and subsequent illness, as well as equipment used to manufacture the gases. 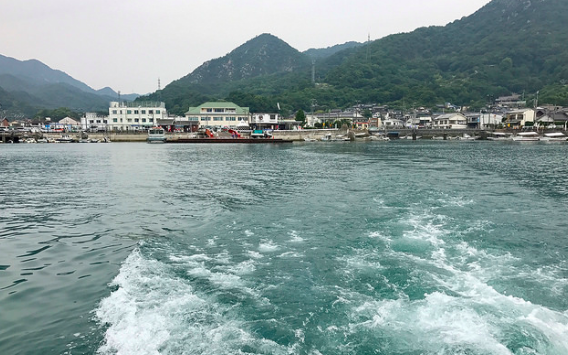 Today, Ōkunoshima is easily accessible via a 15-minute ferry, and embodies peace, rest, and relaxation for tourists and locals alike. Visitors can easily explore it on foot (the island is less than 2.5 miles in circumference), collect souvenirs, dine, play tennis, swim in the ocean, and bathe in the hot spring—apart from communing with the wildlife, of course. Rabbit Island’s website describes it as a place to seek good fortune for your own family’s fertility, and advertises whipped ice cream and “original rabbit items” for sale, as well as octopus kelp rolls, a local delicacy known to pair well with sake. Yet even the island’s thriving tourist industry and booming bunny population has a more sinister flip side. The wild rabbits depend on visitors for their food and water, but tourists often come bearing snacks that are harmful to the creatures’ delicate digestive systems—such as cabbage or vegetable peelings, which can cause fatal bloating. And while visitors are keen to share photos of their new fluffy friends online, social media has played a key role in destabilizing the rabbit population: Viral videos and articles have led to a vast influx of tourists in the past decade, and the resultant avalanche of snacks and treats has contributed to a breeding boom that the island’s ecosystem is unable to handle. These factors have combined to lower the bunnies’ life expectancy to only two years, compared to the three-to-five-year lifespan of the average wild rabbit. The plight of the Ōkunoshima rabbits is just one example of the widespread harm social media has inflicted on wildlife populations across the globe: For instance, viral YouTube videos of slow lorises, wide-eyed nocturnal primates native to Southeast Asia, have led to people taking home lorises from the wild to keep as their own. Unfortunately, captivity is unhealthy for the animals, and they often end up relegated to props in tourist photos—or worse, sold into the illegal pet trade, and possibly slaughtered for use in cuisine or medicinals. 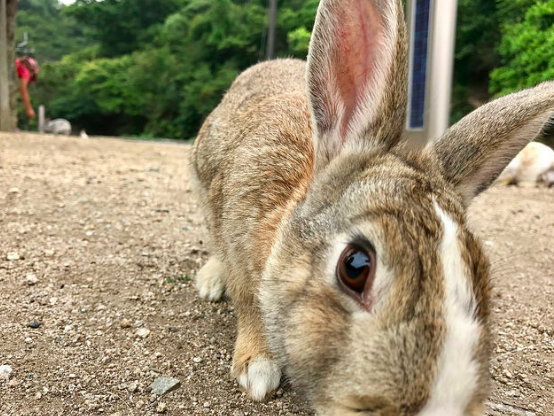 Ultimately, bunny lovers need not be deterred from visiting Ōkunoshima, but following the rules is essential in order to treat the creatures kindly and foster their health and wellness. The Rabbit Island website lays out guidelines for responsible rabbit enthusiasts—including “refill water pans” and “check under your car,” as curious bunnies might hide underneath to escape the hot sun—and travelers can use their visit as an opportunity to educate friends and family about the unique perils posed to wildlife in the digital age. Approaching this mystical island mindfully is a small yet important step in helping the myriad diverse populations of the animal kingdom survive and thrive for many years to come.